Dawn Porter’s hair and my week so far. I have become a little bit obsessed with Dawn Porter’s hair cut and I couldn’t resist a good doodle, cue new illustration. I have a massive urge to hack mine off again, but I really don’t think i could pull off the bob and bangs look….so so tempted though, I know as soon as I chopped it off I would want my long hair back. Anyway in between planning, creating roughs, emails and painting I have taken a few moments to do some of my own work which is really lovely ( cure Dawn Porter-esq illustration) . My desk this week resembles an explosion in an art shop but we will just over look that for a second! This week has been a little bit hectic, with lovely commissions coming in from all over the world which is just amazing.I have also penned 20 pages worth of advice on promoting yourself as an illustrator and blogger wish me luck editing that bad boy! I am still searching out the perfect place to move to in Cornwall and can I just say now its pretty hard when you can’t decide exactly where you want to live, silly indecisiveness ella! I am slowly starting to feel a lot more myself mentally, I still have days were I slip up and feel overwhelmed and lonely all thrown together, but I have made a conscious effort not to spend longer then an hour alone, just due to the fact one of my main abilities is to over think. I have had such wonderful support from you lovely lot, emails, sharing my blog post, and probably giving me the confidence and power to actually tell my family. I’m not going to lie the last three weeks have been a bit of a roller coaster but I am taking small steps which really helps me, over come a few of my issues. One thing that makes me ridiculously happy is the fact I can sit in my most comfiest outfit and paint all day whilst watching Ghost hunters and New Girl. I’m currently working on the two largest illustration commissions which is scary and cool all jumbled together. Would you believe I had the grand total in four days of over 800 illustration enquirers, which was just amazing, so thank you. 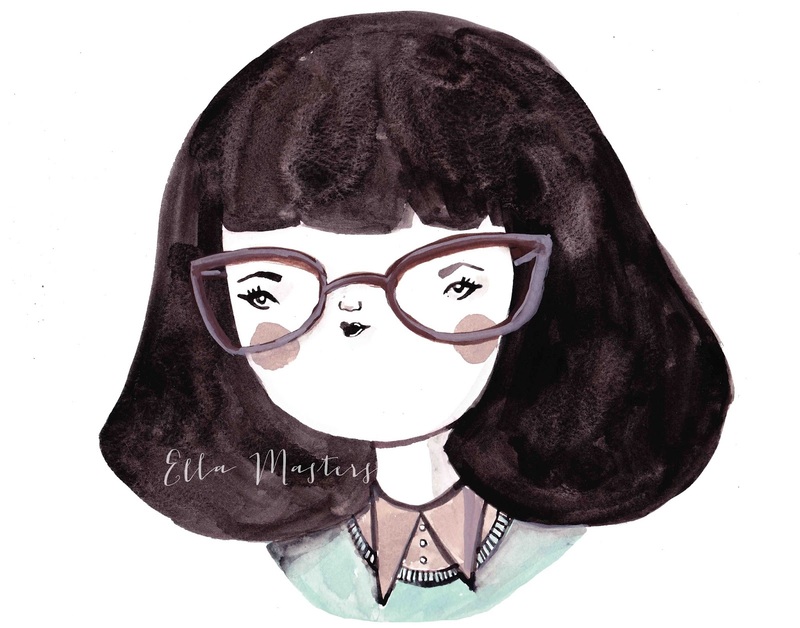 Keep your eyes peeled for my new advice section on this here little blog…. THAT HAIR!!! ohmygoodness Ella!! You always draw the most lovely characters!! I wish my hair looked that perfect when it used to be bobbed! 🙁 She looks beautiful!! Your illustrations never cease to amaze me! So glad you are feeling better to. Really happy to hear you're starting to feel better, I love reading your blog and it's great to see positive stuff like this! Also cannot wait for the advice post! haha ella that is fabulous!!!! you're such a talented lady 🙂 glad to hear you're starting to feel a teensy bit better, small steps! The hair!! This is so cute! It reminded me of Edna Mode of the Incredibles! Haha! thats amazing news about your commissions! also i have such an obsession with dawn porter..i find myself scrolling through her twitter feed way to much..not to mention her amazzzzzzzing husband chris o'dowd..yum. I had the embarrassing pleasure of bumping into him/stalking him at an airport.. Also i think i should also adopt trying not to spend more than an hour alone as i am a massive over thinker too and i go stir crazy in my house alone! Well done on all your progress 🙂 looking forward to hearing more! what a sweet illustration! i've had a bob now for just under a year and because my hair is so fine it never looks as great as that! I share your love for Dawn's hair! Tempted to have it done!